Arsenal's Premier League title aspirations suffered a significant setback as 10-man Blackburn battled their way to a deserved point. The Gunners' best moment came late on, when Nicklas Bendtner had a shot blocked on the line by Michel Salgado. By then, Blackburn had been reduced to 10 men following Steven Nzonzi's two-footed challenge on Laurent Koscielny. Martin Olsson earlier went close with a speculative effort that was fumbled by Arsenal keeper Manuel Almunia. Blackburn grew in belief after a shaky start - and their point owed much to a solid display from keeper Paul Robinson - but this was a distinctly laboured performance from Arsenal. On a day when Manchester United overturned a two-goal deficit at Upton Park to cement their place at the Premier League summit, the Gunners could ill afford to slip up. But falter they did and, as a consequence, they now find themselves seven points behind United - albeit with a game in hand - and contemplating the very real possibility of a sixth successive season without silverware. 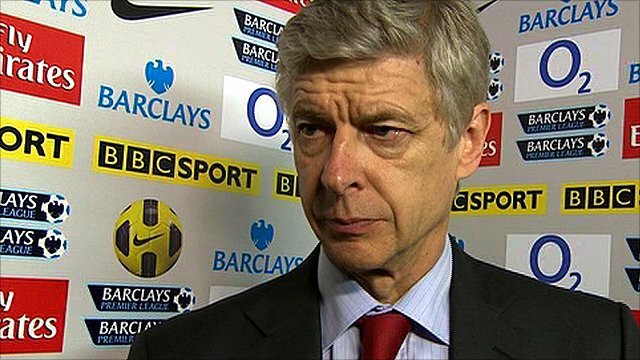 These are not the only statistics that will cause Gunners boss Arsene Wenger discomfort. This was his side's third successive league draw and it came not only against a team with the worst defensive record away from home in the entire division, but with captain Cesc Fabregas watching the first 58 minutes from the bench. Yet perhaps the most troubling aspect for Wenger will be the manner in which his team's conviction seemed to slowly dissipate after a promising opening, belatedly returning only once Nzonzi's dismissal had handed them the numerical advantage. Blackburn's ambitions were initially limited to keeping the hosts at bay and barely five minutes had passed before Arsenal set up camp deep in enemy territory. As Rovers backed off, Alex Song and Theo Walcott - both returning from injury - were soon causing anxious moments in the visiting defence. Walcott went the closer of the two, forcing a sharp near-post save from Robinson, and for a time it looked like the visitors might be overrun. Robinson's services were required again soon afterwards, with Ryan Nelsen almost putting through his own net as Arsenal revelled in the space they were afforded. But for all their possession, Wenger's side could not force a breakthrough. 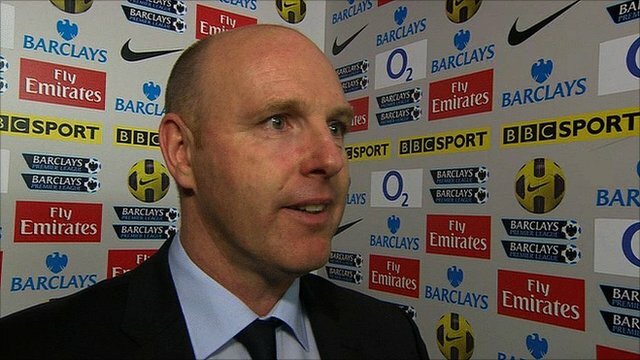 Before long, Blackburn boss Steve Kean was barking orders from the touchline, urging his players to put more pressure on the ball. Olsson may have interpreted his manager's instructions a little too literally, for moments later he was involved in a crunching challenge with opposing full-back Bacary Sagna. When Samir Nasri subsequently headed over under pressure from Ryan Nelsen, receiving a knock on the side of his head which produced immediate swelling, the physical intensity was ramped up a notch further. And as Blackburn's appetite for the contest increased, so too did their threat on the counter-attack. They received further encouragement when the defensive fragility that has undermined Arsenal's campaign in recent weeks once again reared its head. Not for the first time, the chief culprit was error-prone keeper Almunia. When Olsson tried his luck with a speculative effort that bounced off Almunia's hands before spinning wide, the home support - who had earlier greeted a successful catch by the Spaniard with ironic cheers - let out a collective groan of dismay. The keeper's performance came under further scrutiny late in the first half when he failed to make contact with an upfield punt from Robinson, allowing an Nzonzi header to trickle just wide of Arsenal's unprotected goal. By then, the home side had squandered further chances, the most notable of which came when Nasri squared for Jack Wilshere, who should have done better than send a mistimed shot wide from eight yards. Koscielny later forced another sharp save from Robinson with a close-range header from Nasri's corner but not even the return of Fabregas from injury could rouse the home side from their torpor. The catalyst instead was Nzonzi, who went in on Koscielny with studs raised and received a straight red card from referee Phil Dowd for his troubles. Within minutes, a majestic exchange between Van Persie and Wilshere carved open the Blackburn defence to present substitute Marouane Chamakh with a clear chance but Olsson blocked magnificently. Salgado then denied Bendtner on the line and, as Arsenal's afternoon descended into frustration, it became increasingly clear that the day's real winners would be Manchester United. "We had a bad performance today. You don't get away with that kind of performance against a Blackburn side who defended well. "We had no change of pace, no penetration, our rhythm of passing was too slow - exactly how we don't want to play. "It's disappointing, and I'm really concerned about the level of our performance today. "Players have come back from international duty and they're not sharp - half of the team has not recovered." "We're delighted. We showed desire, commitment and togetherness, but we've been showing those qualities for a number of games. "Going down to 10 men, everybody has to do their own job - and they did - I thought we were tremendous. "We've got a bit of momentum and that's going to be key going into the last seven games." 90:00+4:26 The referee blows for the end of the match. 90:00+4:13 Marouane Chamakh takes a shot. Save made by Paul Robinson. 90:00+3:22 Robin van Persie produces a header from inside the area that goes over the crossbar. 90:00+2:51 Bacary Sagna delivers the ball, save by Paul Robinson. 90:00+1:56 Robin van Persie handles the ball and concedes a free kick. Indirect free kick taken by Paul Robinson. 90:00+0:51 Francesc Fabregas gives away a free kick for an unfair challenge on David Hoilett. Paul Robinson takes the direct free kick. 90:00+0:51 Substitution David Dunn on for Jermaine Jones. 89:25 Corner taken by Francesc Fabregas, Headed effort from deep inside the area by Nicklas Bendtner misses to the right of the goal. Correction - 89:08 Inswinging corner taken by Robin van Persie from the right by-line, Nicklas Bendtner takes a shot. Michel Salgado manages to make a clearance. 89:08 Inswinging corner taken by Robin van Persie, Nicklas Bendtner takes a shot. Clearance by Michel Salgado. 85:04 Phil Jones concedes a free kick for a foul on Alex Song. Direct strike on goal from the free kick comes in from Francesc Fabregas. 84:01 Ryan Nelsen fouled by Robin van Persie, the ref awards a free kick. Free kick taken by Paul Robinson. 80:41 Free kick awarded for an unfair challenge on Jermaine Jones by Alex Song. Free kick taken by Paul Robinson. 80:06 Jason Roberts challenges Laurent Koscielny unfairly and gives away a free kick. Jack Wilshere takes the direct free kick. 79:33 Nicklas Bendtner has a headed effort from close in and clears the bar. 78:17 Marouane Chamakh takes a shot. Martin Olsson gets a block in. 77:05 Substitution Samir Nasri leaves the field to be replaced by Nicklas Bendtner. 76:51 Effort on goal by Francesc Fabregas from just inside the box goes harmlessly over the target. 75:14 Direct free kick taken by Francesc Fabregas. 75:14 Sent off Steven Nzonzi shown a red card. Correction - 75:10 Free kick awarded for a foul by Steven Nzonzi on Laurent Koscielny. 75:10 Steven Nzonzi concedes a for a foul on Laurent Koscielny. 74:39 Effort on goal by Steven Nzonzi from just inside the penalty box goes harmlessly over the target. 74:22 Outswinging corner taken by Brett Emerton from the right by-line, clearance made by Robin van Persie. 73:31 Corner taken right-footed by Brett Emerton, save by Manuel Almunia. 72:02 Substitution Marouane Chamakh joins the action as a substitute, replacing Theo Walcott. 71:24 Corner taken by Robin van Persie from the right by-line, clearance by Christopher Samba. 68:29 Martin Olsson is ruled offside. Bacary Sagna takes the indirect free kick. 66:36 Unfair challenge on Jermaine Jones by Alex Song results in a free kick. Paul Robinson restarts play with the free kick. 64:00 Drilled left-footed shot by Robin van Persie. Save made by Paul Robinson. 61:51 Substitution Jason Roberts is brought on as a substitute for Roque Santa Cruz. 61:20 Centre by Bacary Sagna, clearance made by Christopher Samba. 57:37 Substitution Andrey Arshavin leaves the field to be replaced by Francesc Fabregas. 55:38 Bacary Sagna fouled by David Hoilett, the ref awards a free kick. Free kick taken by Bacary Sagna. 55:08 Samir Nasri takes the inswinging corner, Laurent Koscielny takes a shot. Save made by Paul Robinson. 54:22 Foul by Brett Emerton on Alex Song, free kick awarded. Gael Clichy restarts play with the free kick. 52:33 Booking Alex Song booked. 47:46 The ball is crossed by Theo Walcott. 46:02 Inswinging corner taken by Robin van Persie from the right by-line. 45:00+4:06 The first half comes to an end. 45:00+2:45 Bacary Sagna has shot on goal from just outside the penalty box which goes wide of the right-hand upright. 45:00+2:32 Corner taken by Robin van Persie from the right by-line. 45:00+2:14 Samir Nasri takes a shot. Blocked by Christopher Samba. 45:00+0:13 Headed effort from inside the area by Steven Nzonzi misses to the left of the target. 44:07 Foul by Alex Song on Jermaine Jones, free kick awarded. Paul Robinson restarts play with the free kick. 42:47 The official flags Andrey Arshavin offside. Paul Robinson restarts play with the free kick. 40:55 Michel Salgado produces a cross, Sebastien Squillaci makes a clearance. 39:52 Theo Walcott has an effort at goal from just inside the box that misses to the left of the goal. 39:30 Outswinging corner taken right-footed by Brett Emerton from the right by-line, save by Manuel Almunia. 38:20 Robin van Persie fouled by Christopher Samba, the ref awards a free kick. Direct free kick taken by Andrey Arshavin. 38:20 Booking Michel Salgado receives a caution for unsporting behaviour. 36:33 Unfair challenge on Michel Salgado by Andrey Arshavin results in a free kick. Direct free kick taken by Paul Robinson. 35:59 Robin van Persie takes a short corner. 35:08 David Hoilett has an effort at goal from just inside the box that misses to the right of the goal. 33:48 Theo Walcott fouled by Michel Salgado, the ref awards a free kick. Laurent Koscielny takes the direct free kick. Correction - 32:19 Outswinging corner taken from the right by-line by Brett Emerton, Christopher Samba takes a shot. Manuel Almunia makes a save. 32:19 Outswinging corner taken from the right by-line by Brett Emerton, Ryan Nelsen takes a shot. Save by Manuel Almunia. 31:54 Martin Olsson has an effort at goal from 20 yards. Manuel Almunia makes a save. 29:47 Free kick awarded for an unfair challenge on Bacary Sagna by David Hoilett. Bacary Sagna takes the free kick. 29:47 Booking David Hoilett receives a caution. 28:33 Close range shot by Jack Wilshere goes wide of the right-hand upright. 27:23 Andrey Arshavin takes a shot. Save made by Paul Robinson. 27:19 Short corner worked by Robin van Persie. 26:50 The ball is sent over by Bacary Sagna, blocked by Martin Olsson. 24:31 Bacary Sagna concedes a free kick for a foul on Jermaine Jones. Brett Emerton delivers the ball from the free kick right-footed from left wing, save by Manuel Almunia. 22:30 Foul by Laurent Koscielny on David Hoilett, free kick awarded. Brett Emerton fires a strike on goal direct from the free kick. 18:17 Shot by Martin Olsson from deep inside the penalty area misses to the left of the target. 16:32 The assistant referee signals for offside against Roque Santa Cruz. Free kick taken by Sebastien Squillaci. 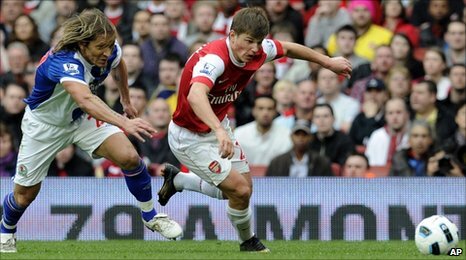 16:06 Andrey Arshavin takes a shot. Ryan Nelsen gets a block in. 15:14 Jermaine Jones fouled by Alex Song, the ref awards a free kick. Paul Robinson takes the free kick. 14:25 The referee blows for offside against Roque Santa Cruz. Sebastien Squillaci takes the free kick. 12:49 Headed effort from deep inside the area by Samir Nasri misses to the right of the goal. 8:16 Short corner taken by Samir Nasri from the left by-line. 7:05 The offside flag is raised against Gael Clichy. Paul Robinson takes the free kick. 6:02 Inswinging corner taken left-footed by Robin van Persie, clearance made by Steven Nzonzi. 5:46 Theo Walcott takes a shot. Save by Paul Robinson. 4:05 Inswinging corner taken from the right by-line by Robin van Persie. 3:41 Alex Song takes a shot. Christopher Samba gets a block in. 3:05 The assistant referee flags for offside against David Hoilett. Manuel Almunia takes the free kick. 1:52 Foul by Alex Song on Michel Salgado, free kick awarded. Direct free kick taken by Michel Salgado. 0:28 Unfair challenge on Theo Walcott by Steven Nzonzi results in a free kick. Direct free kick taken by Theo Walcott.